At a Glance: 24 grams of premium blended protein per scoop 10 distinct protein sources provide sustained-release action for A.M./P.M. coverage 5 grams of dietary fiber to help keep you full longer Lipid blend supplies 4 grams of omega-3, -6, and -9 fatty acids plus MCTs 35 milligrams of enzyme blend for easier digestion and absorption Optimum Nutrition NitroCore 24 is a full-spectrum, sustained-release protein blend designed to be used any time of the day or night. In addition to 24 grams of blended protein per scoop, NitroCore 24 provides 5 grams of hunger-satisfying dietary fiber, omega fatty acids, and monounsaturated and MCT fats for energy and a taste that’s creamy and incredibly delicious. And, as you’d expect from ON, NitroCore 24 is instantized to mix easily so you can enjoy it everywhere. 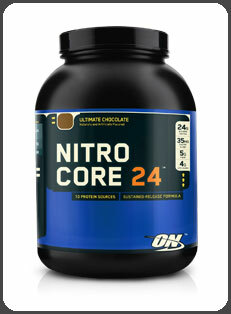 Optimum Nutrition Nitrocore 24, Ultimate Chocolate, 6 pounds. A full-spectrum, sustained-release protein blend designed to be used any time.